The competition of "Pequeños Gigantes USA" came to a dramatic close as the night packed with emotion, surprises and lots of talent, the Peque Flow team took the stage and once again demonstrated their dancing, singing and acting skills as its members fulfilled their big goal: to be the stars of the first U.S. produced season of the popular children’s talent competition. The Peque Flow team, made up of JeanPaul, Ashley, Almany, and Joel, led by captain Johnny Lozada, faced off against the Mega Minis, consisting of Edrai, Alondra, Hadasha, and Giuliana. But Peque Flow received the most audience votes and took home the $100,000 grand prize, to be divided among themselves. Almost one million audience votes were submitted by phone and on social media, and the audience chose its winner with 80% of votes during the final period, from Monday, April 3 to Wednesday, April 5. As part of the big night, Espinoza Paz took to the stage alongside mariachis to sing “Qué Mal Te Ves Sin Mí” impressing the judges with an unique performance. Eugenio Derbez, in his second visit to the program, performed a scene inspired by his new film “How to Be a Latin Lover” with child actor Raphael Alejandro. Broadcast over nine weeks on Mondays through Thursdays during the 8 p.m. ET/PT primetime slot, the program allowed families to enjoy the extraordinary talent of 22 kids between the ages of 6 and 11 from across the U.S. and Puerto Rico. Six teams were led by well-known stars of Hispanic TV. The other 5 captains and teams who took part in the first season were: Jonatán Sánchez with Los Rebels, Paulina Goto with the Súper Peques, Rogelio Martínez with Pequeños Guerreros, Karol G with Los MVPs, and Daniela Luján with the Mega Minis, who were the runners-up in the competition. The kids also got the chance to meet, work with and learn from other celebrities, including Charityn Goyco, Jerry Rivera, Ximena Córdoba, Arap Bethke, Livia Brito, Leslie Grace, Víctor Manuelle, and Ozuna, as well as personalities from Univision and Univision Deportes, including Alejandra Espinoza, Borja Voces and Lindsay Casinelli. 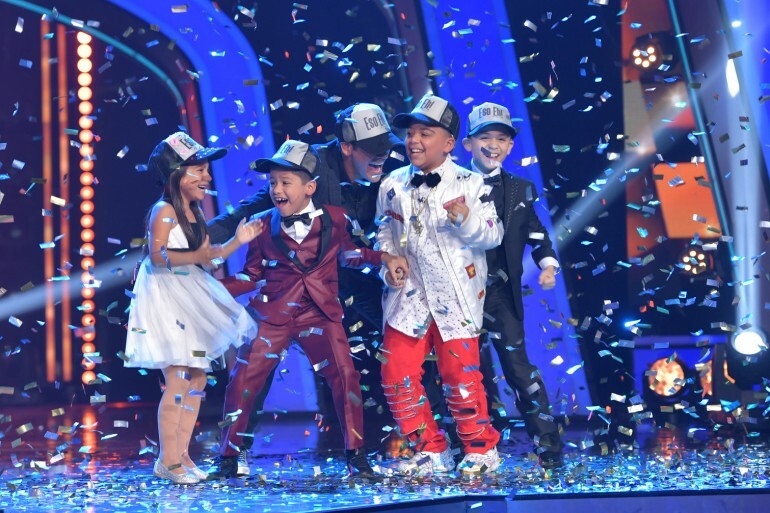 “Pequeños Gigantes USA” was hosted by Giselle Blondet, who was joined by judges Prince Royce, Bianca Marroquín and Luis Coronel, as well as social media reporter Sebastián Villalobos, and was produced and broadcast exclusively by Univision.